A man who appears to have no particular passion for anything ironically proves effective with troubled high school students. Known as a legendary savior of problem schools, he shows up one day to salvage what's left of a class that had fallen apart completely. His highly unpredictable reactions and controversial advice to students shock the teachers and staffs much as they do the problem students themselves. The entire article, or this section needs to be cleaned up to conform to a higher standard of quality. Reason: Translation must be confirmed. See How to Edit and Manual of Style for help, or this article's talk page. 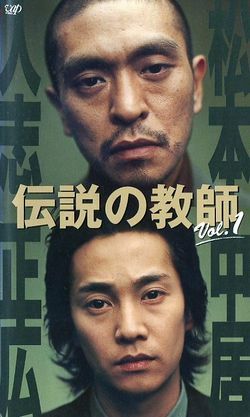 A hopeless inveterate gambler in debt (Matsumoto Hitoshi) is beaten up by a gangboss (Takenaka Naoto), and forced to work in a highschool as a lead teacher til he pays his debts off. His co-teacher is demoted by the gangboss (secretly) and is played by Nakai Masahiro. Hitoshi and Masahiro have incredible rapport, stunning comedic dialogues, and a brilliant staging during their 11 adventures as they problem solve difficulties in the high school in areas such as: bullying, a mother/son problem, an arrogant girl with no friends, a suicide, and all along Hitoshi is shaken down by the gangboss everytime he receives a paycheck. Some call it the comic side of GTO. For Americans it is the equivalent of "Room 222" or "Welcome back Kotter", but with an IQ of 150, not 25. A smart series, with unpredictable incredible plotting, superb comic patter (the comic routines were scripted by Hitoshi/Naoto, and at times improvised). No script for this on the internet in English, and no translations on any disk available in English, but was available for a time in HK with Chinese subtitles as a bootleg. Waiting to be made into a film. This page was last edited on 11 January 2017, at 12:13.